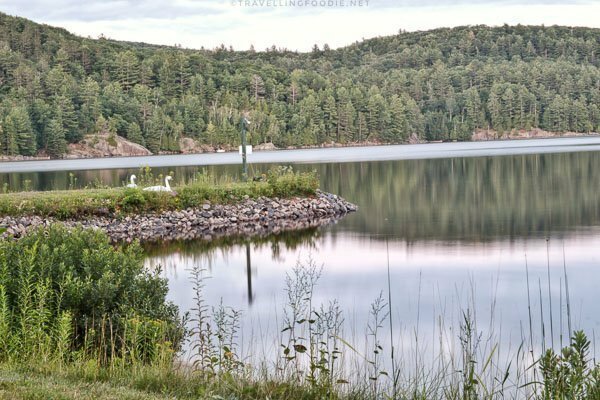 Haliburton Highlands is a popular cottage country in Ontario. It is comprised of different townships and municipalities: Algonquin Highlands, Haliburton (Dysart et al), Highlands East, and Minden Hills. 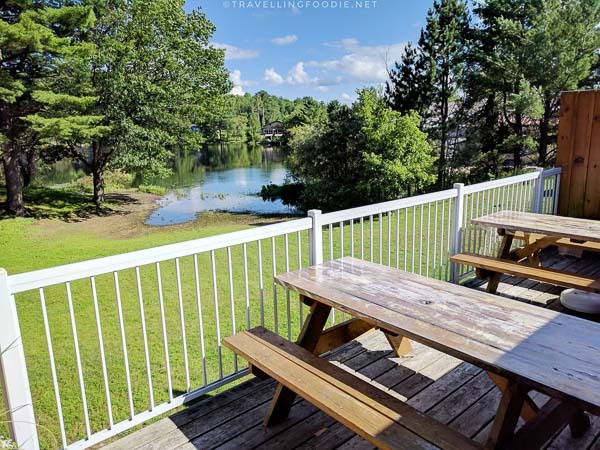 I love visiting the cottage country because it has everything a Travelling Foodie wants: Food, Nature and City life. 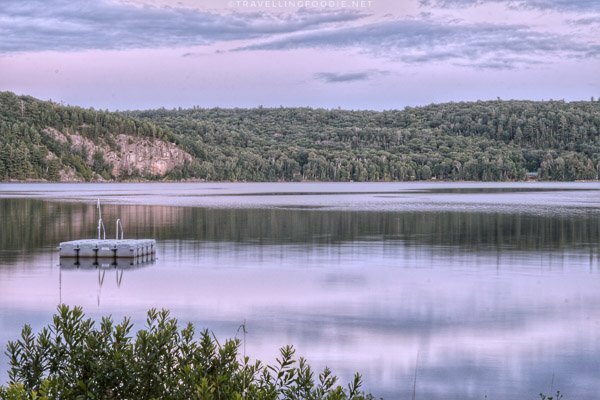 Haliburton Highlands is no exception with about 600 lakes, numerous streams and rivers. It’s a region rich with heritage and a growing arts community with amazing and friendly people. I always find it interesting to explore the food scene in cottage country because they are not commercialized chains, but mom and pop shops that you won’t find anywhere else. 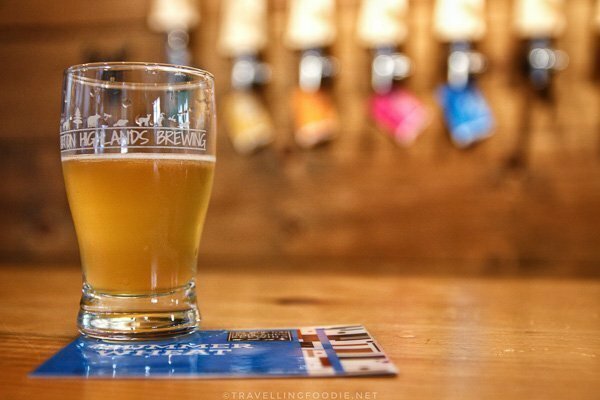 Interestingly enough, there are two local craft breweries in Haliburton Highlands as well. 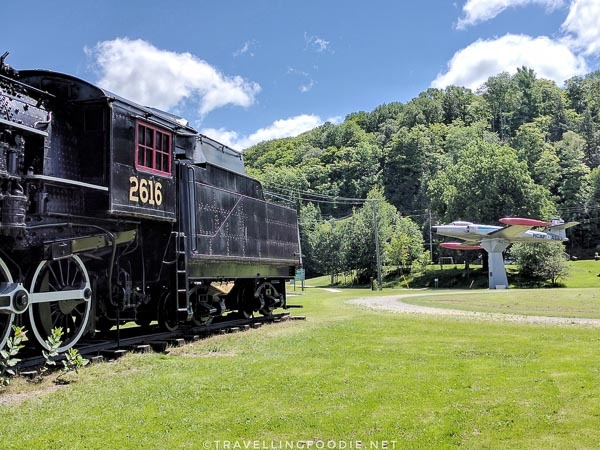 I had always wanted to explore Haliburton Highlands having visited the area in passing before when my aunt had a cottage in Hastings Highlands. It would be a quick pit stop for some snacks or gas. 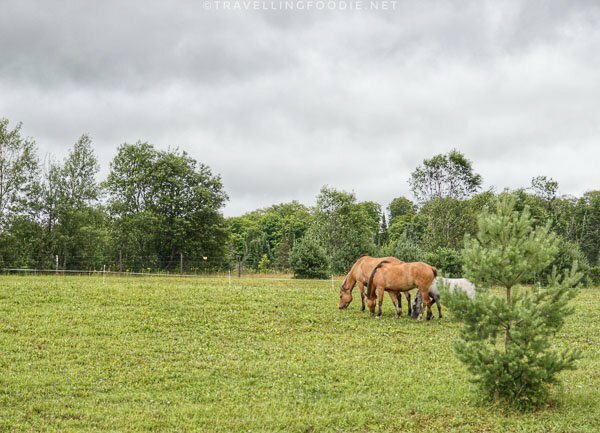 Therefore, I was so happy to have had the chance to go on a sponsored trip in collaboration with Ontario Culinary to explore #MyHaliburtonHighlands. 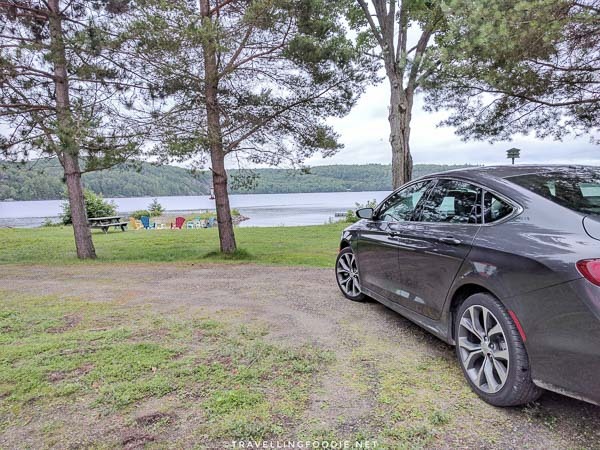 I was there for 3 nights and it was such a great experience, really tried to make the most of the beautiful Haliburton Highlands. Here’s a quick recap of my trip to Haliburton Highlands. 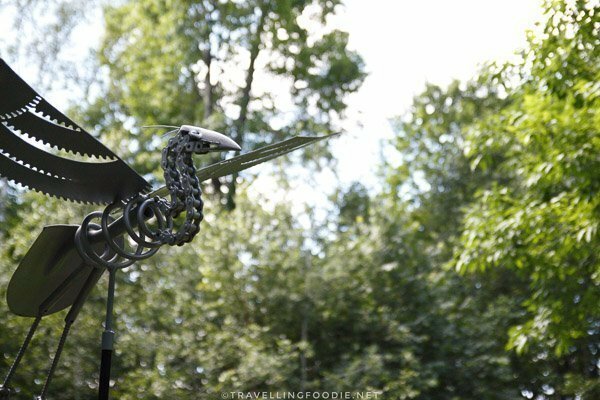 In this blog I’ll be going in detail on the where to eat, what to do and where to stay! 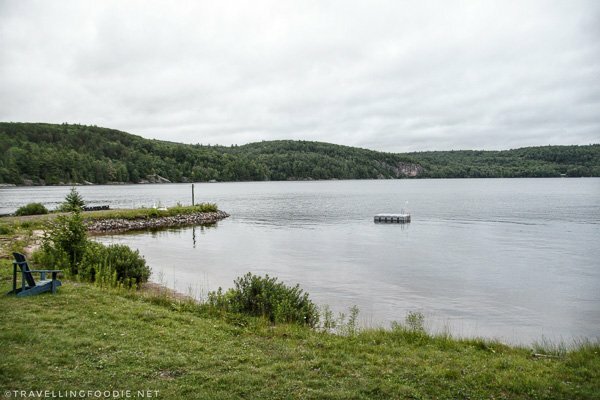 Haliburton Highlands is about 2.5 hours from Toronto (4 hours from Ottawa, and 9 hours from New York). As I don’t have a car, I got my rental car with Advantage, a car and truck rental company operating since 1984. One thing I learned is they have a delivery service. What better way to have my Chrysler 200 rental for the trip than having it delivered right at my condo door. So from what I heard, bug season in Haliburton Highlands is in May because of the May flies so I went in July. Luckily, despite the initial forecast of rain and flies, it ended up being nice weather for me. I did buy two cans of bug spray just in case though. Travelling Foodie Tip: Gas prices in cottage country are much cheaper than in Toronto. When the prices in Toronto were around 112, it was 103 at Minden. After the trip, I just drop it off in one of the 10 locations in GTA and they dropped me off back to my condo. NOTE: Food photos may not represent actual portions. Prices listed are taken from menu/website at the time of writing this article. Rhubarb Restaurant is the only restaurant in Haliburton Highlands that is Feast On certified with Ontario Culinary. 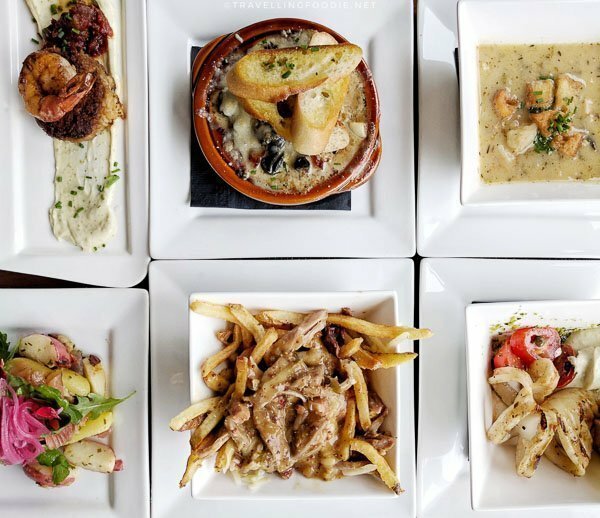 This means Chef Christoph Carl and his team uses local and seasonal ingredients from Ontario’s farmers and artisans on the entire menu, all made in house. They also have dinner features that change daily. Even their wine list features a lot of Ontario wines! 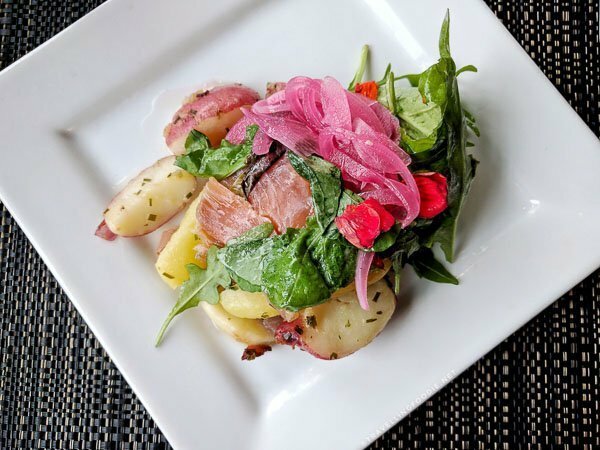 This upscale casual restaurant is right by Mirror Lake, and has lounge seating, bar seating and table seating. 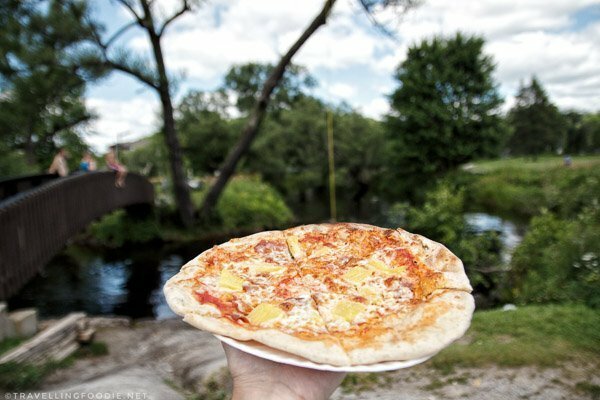 Travelling Foodie Tip: Make sure you reserve and ask for a table by the window to get a nice view of Mirror Lake. Also, indicate that you don’t want to be moved. Rhubarb is unique because Boshkung Brewing Co. is on the same site since they have the same owners. 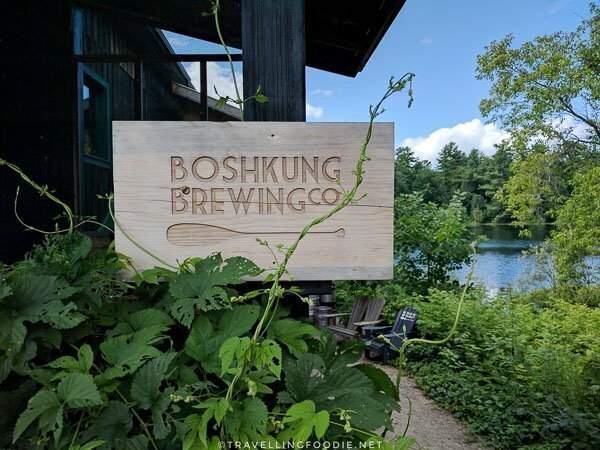 Therefore, you can enjoy beer from Boshkung Brewing at Rhubarb because they have kegs from the brewery that connects directly to the bar taps on the restaurant. 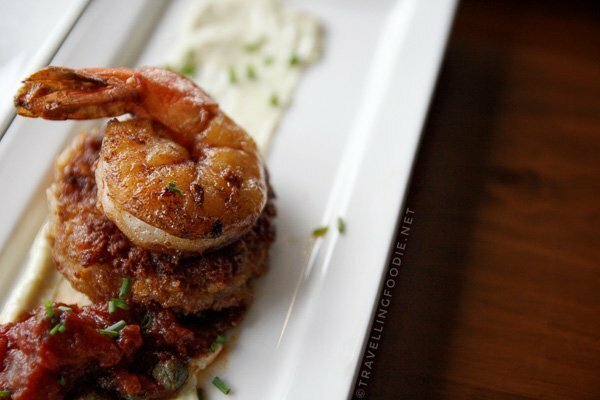 The Crab Cake was one of my favourite appetizers. A big lump sized cake filled with crab and little to no fillers, it really has the strong crab taste I look for in crab cakes. And obviously, a big shrimp on top is a nice bonus. I love escargots and was definitely surprised to find this in cottage country. These were so good with the mushroom, parmesan and bacon. I had to dip the bead with the sauce after! A very different take on poutine using old cheddar instead of cheese curds and mustard gravy instead of regular gravy, but it worked. 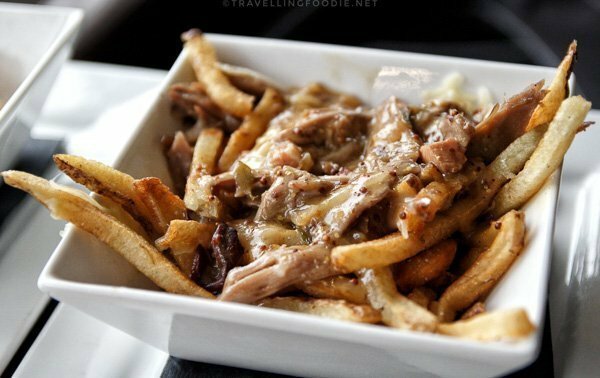 This duck confit poutine had generous amounts of duck confit too. My favourite dish of the night was the Bison Striploin. 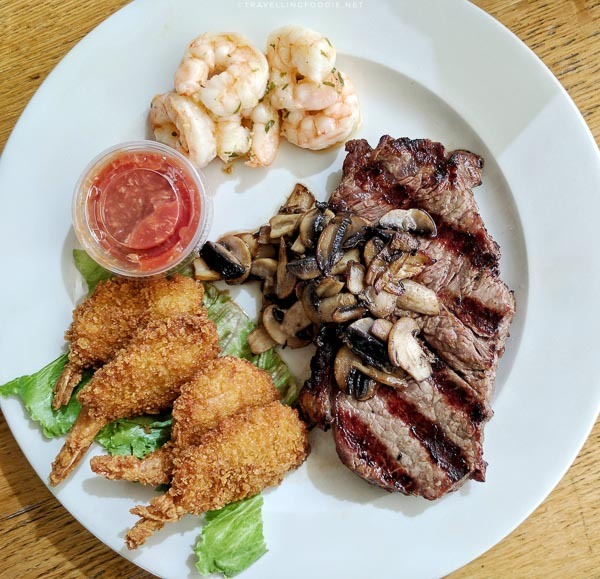 You don’t find Bison normally so I definitely wanted to order this when I saw it on the Daily Dinner Feature. 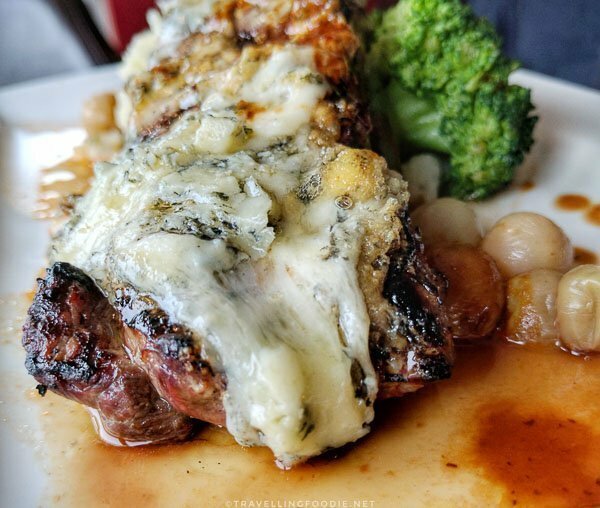 I know blue cheese is acquired taste but it went perfectly with the bison – trust me on this. 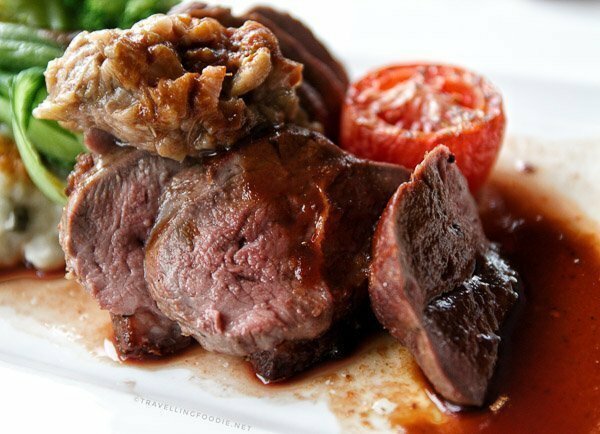 Bison meat is very lean so it is very easy to overcook but they cooked it perfectly to my doneness. Chef Christoph is German so you must definitely try his schnitzel. They have three choices on the menu, but I love mushroom sauce in general and this sauce was recommended by the server as well. 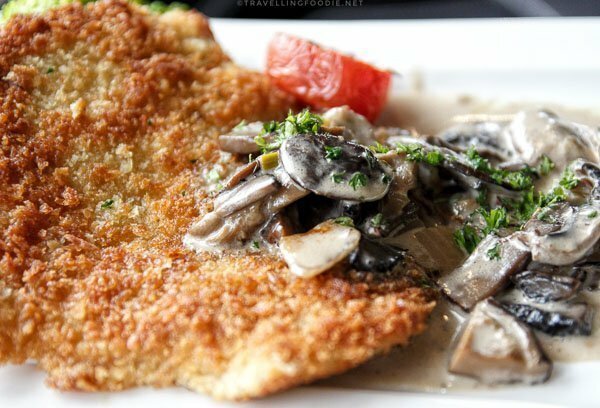 Perfectly crispy on the outside and moist and tender inside, the pork schnitzel went great with the mushroom sauce to make it a little wetter – otherwise, it will taste very dry once you keep eating. The desserts are only on the Daily Dinner Features so, if you loved it, you need to order more because you don’t know when it’ll be back. 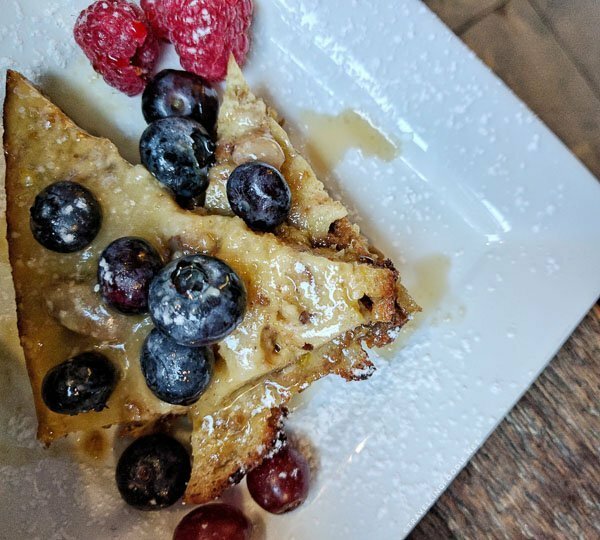 I really enjoyed the bread pudding because it had the right texture – neither mushy nor crunchy. It was just the right amount of sweet too. 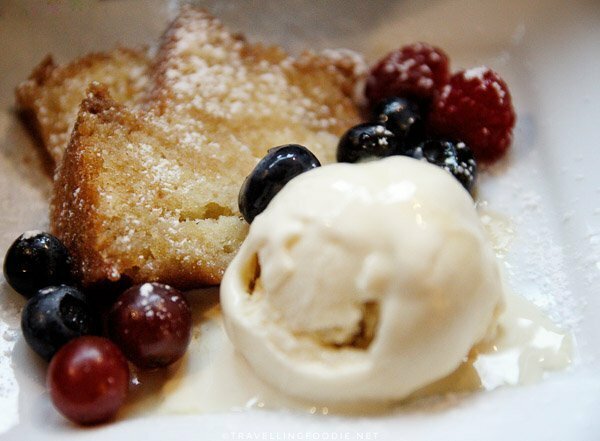 The added fruits gave some nice citrus notes to the pudding. Maple Avenue Tap & Grill is a casual pub with a nice outdoor patio, table and bar seating. This place gets packed fast. I came here on Tuesday 5pm, and near 6pm it’s already full. Great news is that, around October 2018, Maple Avenue will be moving to Hankook location with a much bigger space. Chef and owner Andy Oh is very friendly and takes the time to come out of the kitchen to meet and chat with customers. 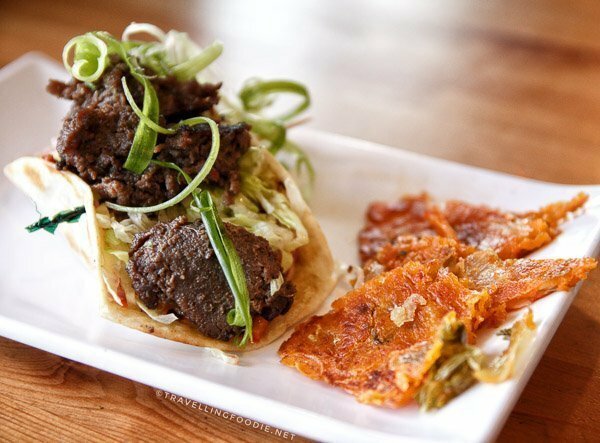 One interesting note is he’s Korean, and what makes this restaurant unique is he adds a Korean twist to some traditional pub food like this Korean Kimchi Tacos with Bulgogi. I really loved this calamari with its light crunchy batter. The squid was flavourful in itself and didn’t need the sauces in my opinion. I also like that the tentacles were included. 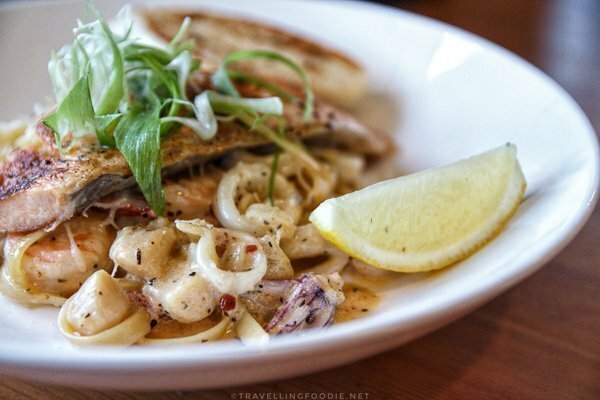 The Cajun Seafood Fettuccine with Salmon was a seafood heaven on a plate with all the seafood I love. Though the salmon was a little overcooked when I had it, the rest of the seafood was just great. The seafood portions were generous too! The Cajun cream sauce was delicious and flavourful. It was creamy but not saucy that you had the right amount of sauce on the nicely al dente fettuccine. The fish and chips had a nice crispy exterior with keeping the fish perfectly cooked inside. The fish-to-batter ratio was just right. The Mill Pond Restaurant is located by Mirror Lake, similar to Rhubarb. Both outside and inside the restaurant look like a cottage so it feels welcoming and relaxing especially when you sit at the patio that overlooks the Mirror Lake. 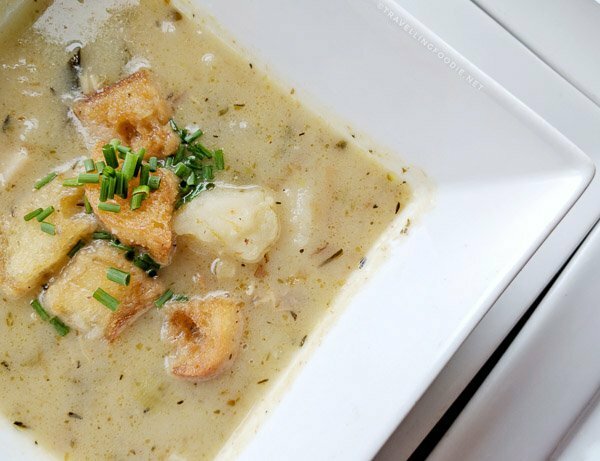 Mill Pond is owned and operated by husband and wife team, Brad and Anne Archer, focusing on home cooked meals made fresh. They have daily dinner specials. 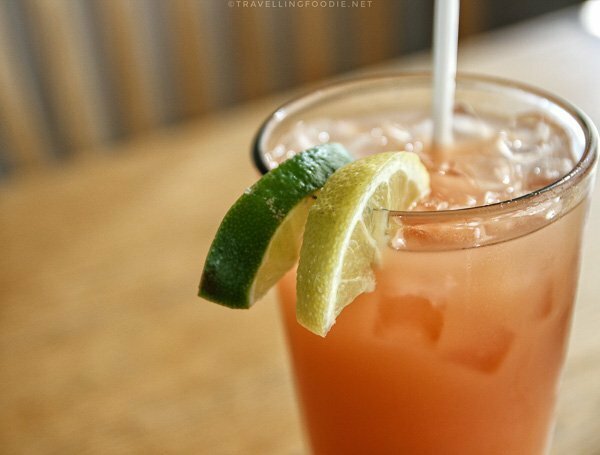 Brad is the one who cooks the savoury food and also makes some cocktails like this refreshing rum punch. The Breaded Chicken Wings were perfectly breaded with juicy chicken inside. I loved the breading used on the wings. You can choose between mild, medium, hot, honey garlic, spicy bbq, or sweet heat sauces. I chose the spicy bbq, and loved it. It just adds a hint of spiciness so I think it will be good even for people who don’t take spicy. 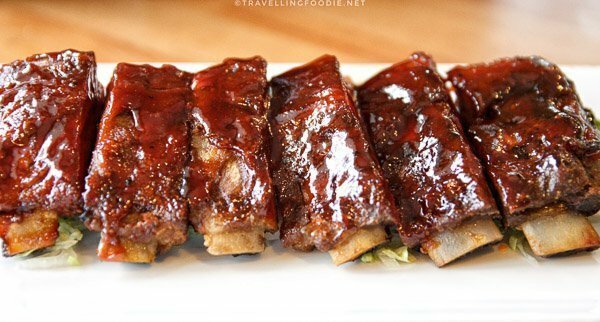 I loved the Baby Back Ribs as well. They were meaty and tender, char-broiled for at least 2 hours. You can choose between BBQ or Honey Garlic Sauce. 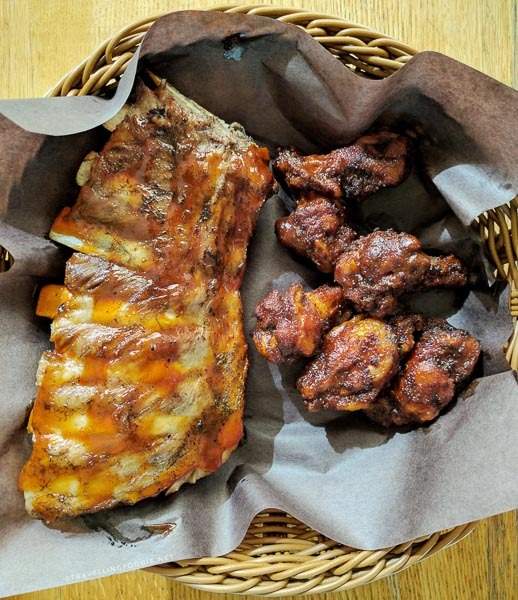 I initially was leaning away from BBQ because I already had spicy bbq for wings, but I just had to get it after the server said the bbq is Brad’s homemade sauce – No Regrets! The beer battered fish and chips were delicious. I thoroughly enjoyed the breading as it is the English style type, and it also had a strong hint of beer – Lake of Bays, in this case – which I enjoyed. The fish was meaty and well cooked. What I wish though is the fish to be thinner as I found the batter-to-fish ratio is a bit off. 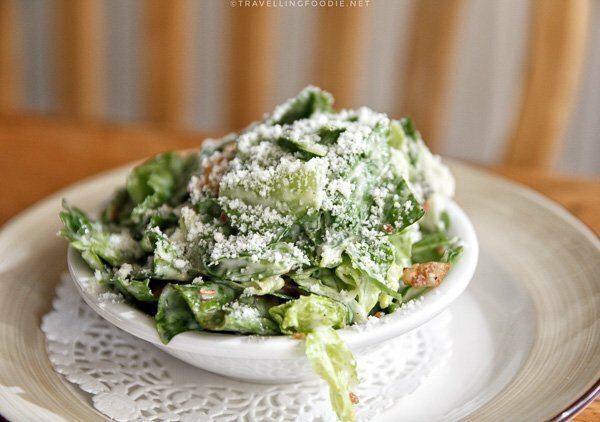 To add some healthiness to my meal, the Caesar Salad was a nice tough with crunchy Romaine lettuce with Brad’s delicious homemade dressing. Anne makes the homemade desserts. You must get these two desserts I tried! 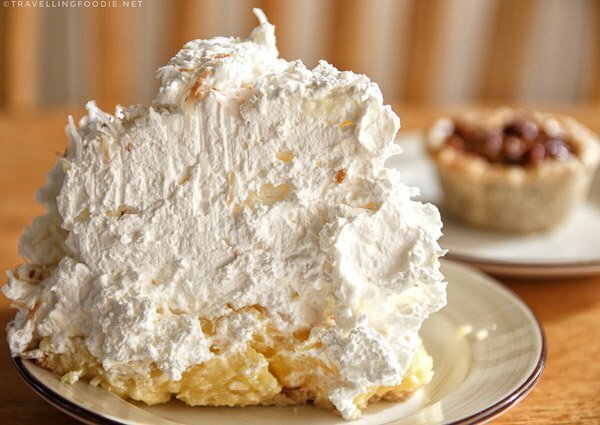 I haven’t had much Coconut Creme Pie but this was one of the best I had. There’s only one good place in Toronto for this, unfortunately. 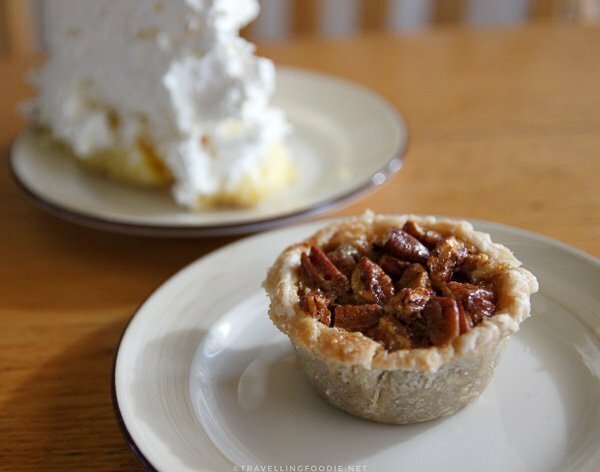 Again, another winner was the pecan butter tart with generous portions of pecans on buttery melt-in-your-mouth tart. I also love that the inside isn’t overly sweet. Both of them go perfectly with a nice cup of coffee. Molly’s Bistro Bakery reminds me of going to Grandma’s house, or cottage in this case. Similar to Mill Pond, the exterior and interior feels like being in a cottage. The restaurant is only open for breakfast and lunch (7am-3pm daily). I came here for lunch at around 1pm. From that time until I left, the place was busy with people coming in to eat. Molly herself comes out to mingle with the customers. 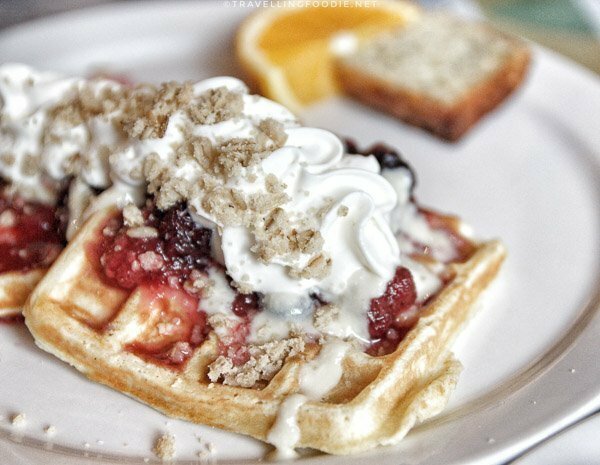 At Molly’s, all the food is homemade and baked from scratch. 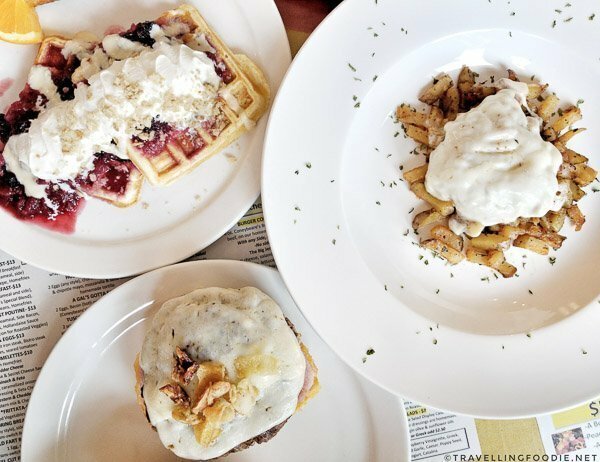 They serve all-day breakfast, sandwiches and lunch menu. Also, there are off-menu daily features on special, grill, soup and salads that change every day. The Oh Canada! 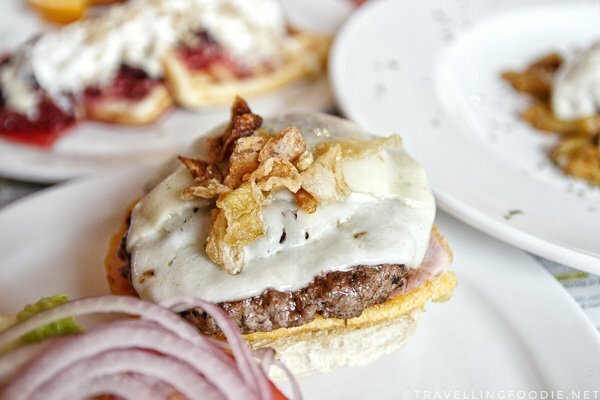 Burger is quite an interesting burger with its mix of sweet and savoury toppings that worked well together. The ground beef used is from a local butcher, Coneybeare’s Butcher Shop. You can really taste the difference in quality. If you like lean burgers, these are for you as the patty is very lean. I loved the pulled pork poutine. It’s not your typical poutine – this one is actually healthier. 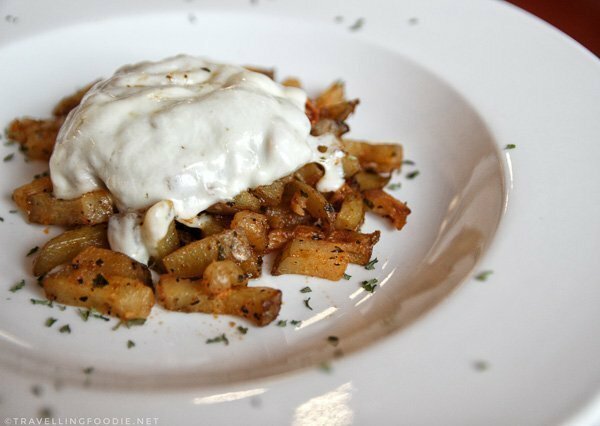 Instead of french fries, or fried potatoes, it uses delicious and still crunchy roasted homefries. The pulled pork was so flavourful and tender – it comes from a local meat shop as well. 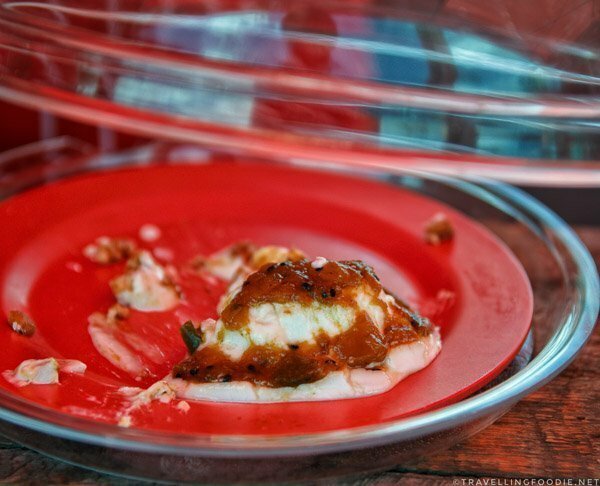 Instead of curds, you get a dome of mozzarella covering the pile of pulled pork. It makes for a great #cheeseporn (see for yourself in the video). 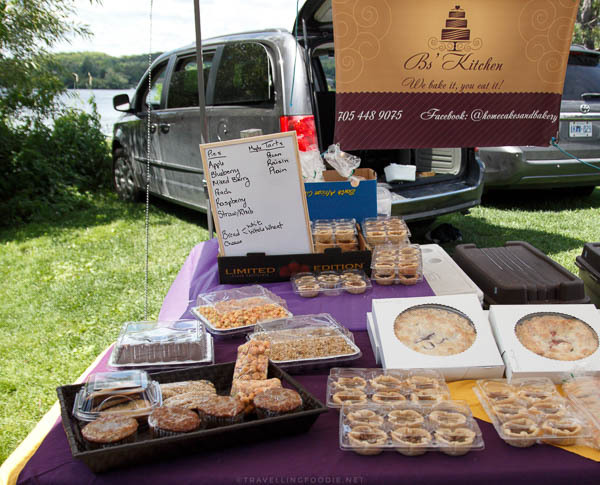 They have a wide variety of baked goods too, all homemade baked daily, including squares, tarts, cookies, fruit pies, bread and more. 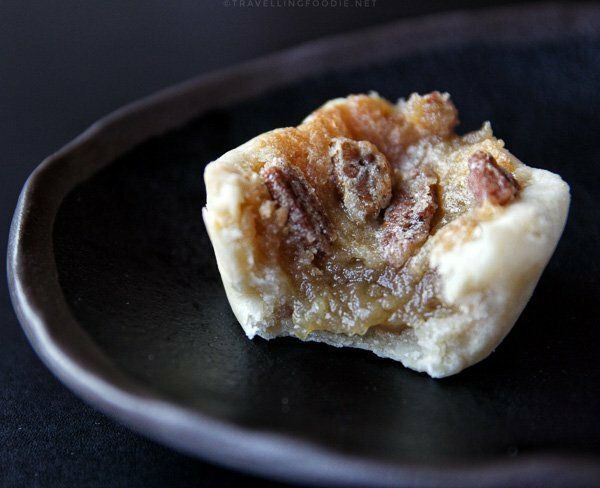 I’m a sucker for maple walnut and thoroughly enjoyed the Gooey Chewy Maple Walnut Square with its strong maple flavour with lots of walnuts. The lemon squares reminds me of having a delicious lemon meringue pie. 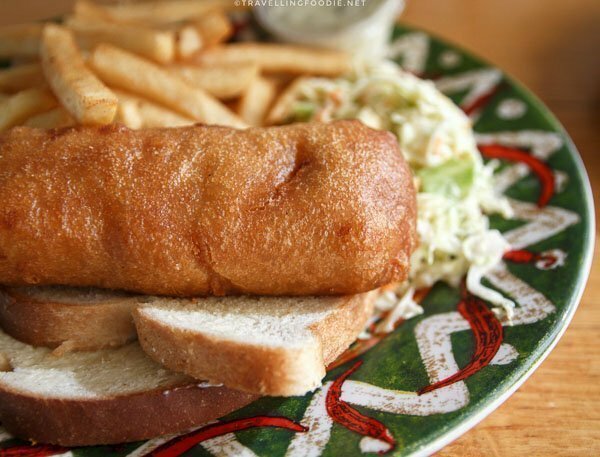 Baked and Battered: Cottage Bakery and Fish Fry is two restaurants interconnected in one big restaurant. You have the bakery and cafe side which offers sandwiches, homemade pastries baked daily, coffee and tea, and more. 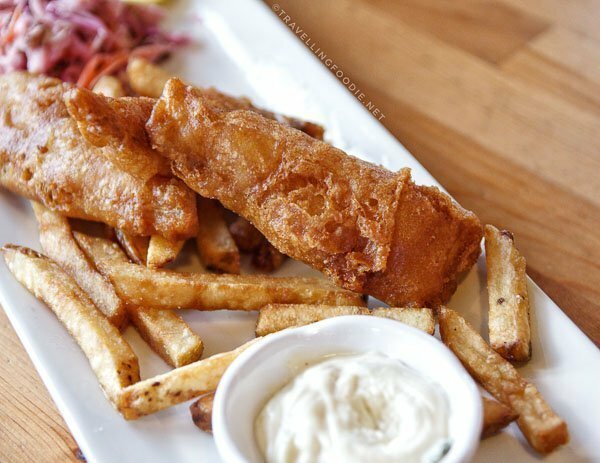 And you have the fish fry side that offers all the fried goodness. Travelling Foodie Tip: Though they appear as separate restaurants, each with its own ordering counter and everything, you can actually order food from both places at either side. You just need to know what you want to order from both when you reach the counter. I enjoyed their scallops, which you can get as a meal or on its own. The scallops are big and meaty. It was flavourful enough that I preferred eating it on its own, instead of dipping on the marinara sauce that came with it. You must get the Alaskan Halibut here. It’s one of the best halibut I’ve had, and halibut is easy to screw up. The halibut was thick, juicy and firm without being tough. The halibut are hand-cut in the kitchen so you know they are fresh. The batter was crispy and thin with hints of pepper, but I personally still prefer the English style batter with crunchy outside, fluffy inside. I changed the fries to onion rings. 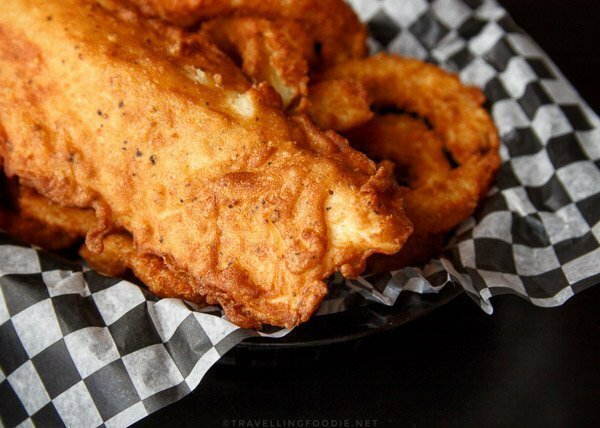 The onion rings were big and thick circles which I love, and the onions were sweet too. From what I learned about their fries after, they are brought in fresh-cut and never frozen. I wish I got to try them. 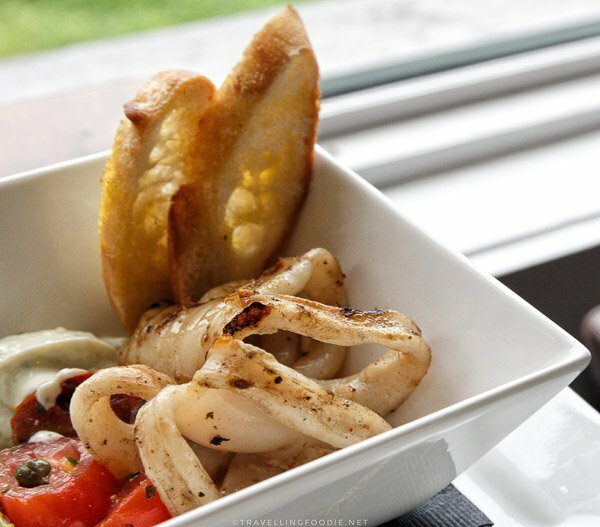 La Luna del Nordo is a new Italian restaurant in the scene in a rustic cottage atmosphere. 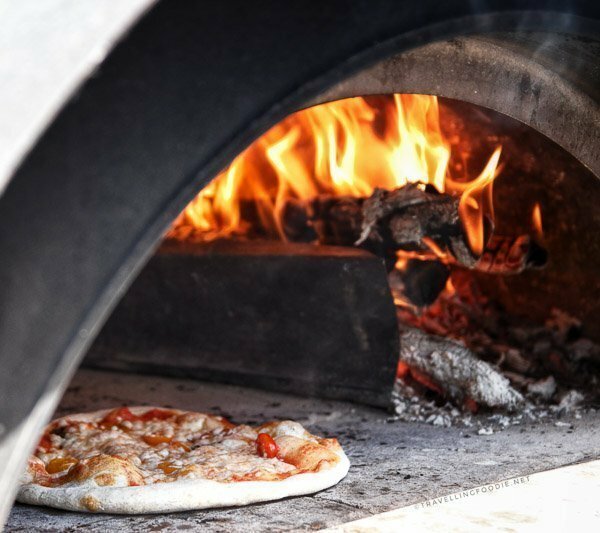 The restaurant specializes in wood fired handmade pizzas, homemade pastas, and Italian sandwiches on freshly baked paninis. 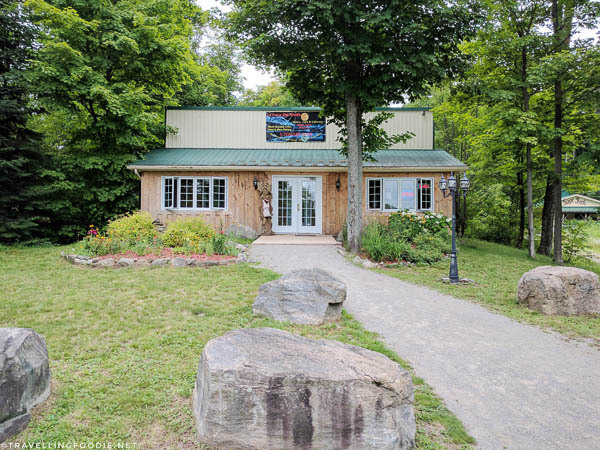 Owners Anna and Silvio have decided to stop operations of Moon Shadows Estate Winery to focus on this restaurant and continue the Maple Moon Sugar Shack. 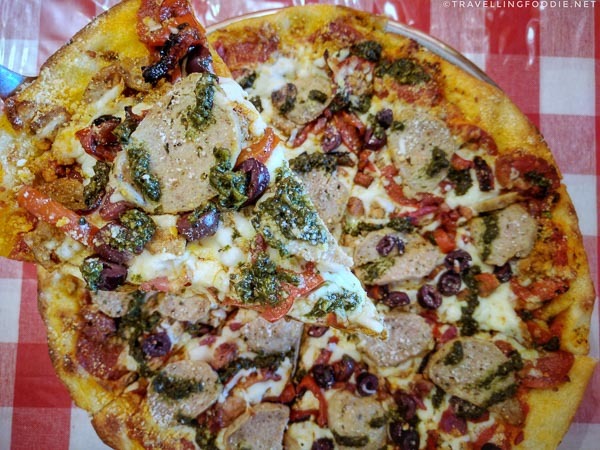 Being a meat lover, the Haliburton Meat Lovers Pizza was the obvious choice. The pizza was a good size and comes in 8 slices, which can probably be shared by 2-3 people. I personally ate half of it because it was so good. The pizza is packed with toppings. I’m glad there were vegetables in this one too as it helped offset the saltiness of all the meat. The crust is thicker than usual for wood fired pizza, but it was crunchy and airy. I saw other people order the sandwiches and they are huge! People just ate half and took the other half home for another meal – that’s great value since the sandwiches range from $8.75-$11.75. They also make a good cup of cappuccino using beans from local company, JBean’s Roastery. 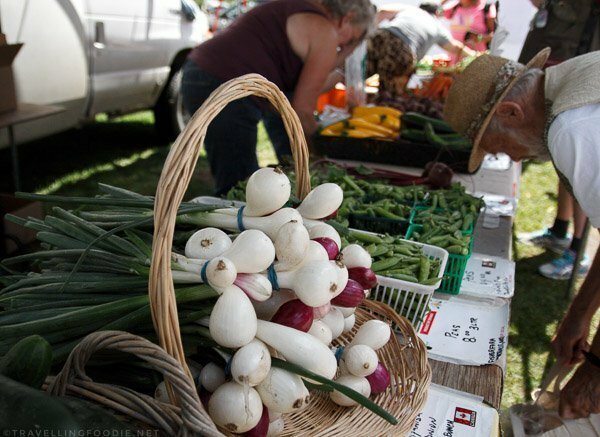 The Haliburton County Farmers’ Market runs throughout the summer, three days a week. Tuesdays at Haliburton from May 23 – October 3. Fridays at Stanhope from June 16 – October 6. And, Saturdays at Minden from May 20 – October 7. 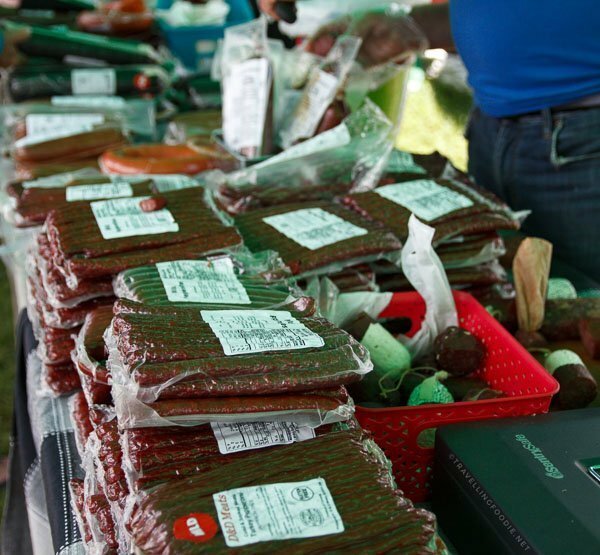 The market was founded by local food activists and local growers to create a venue for artisans, producers and merchants to sell their products grown or produced in the Haliburton County. During my trip, I can only go to the Haliburton location by Head Lake. I loved the location since it is right by the lake so it was nice to take in the view while at the market, and you also see kids enjoying the lake. Before you reach the entrance from the parking lot, you already catch a whiff of something amazing. And as you get closer, you’ll find a big cast iron kettle and Ben stirring the kettle. 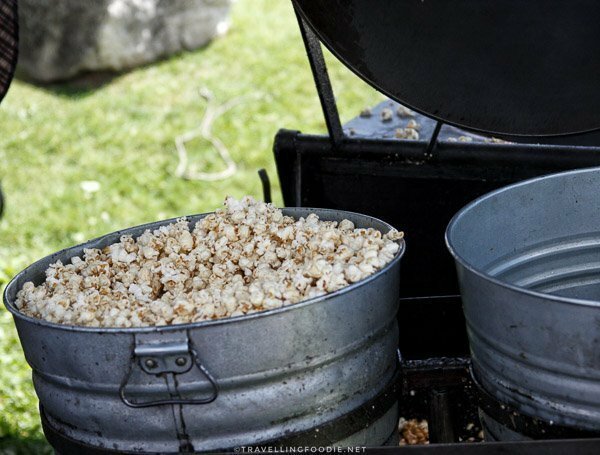 You’ve reached Ben’s Kettle Corn with its caramel or sweet and salty Kettle Popped Corn using GMO free corn. Options for prepared food were kind of limited when I went. I obviously wanted to try Into the Blue Bakery for the Wood Fired Pizza. There is a long line up for their pizzas, but they also sell freshly baked bread. 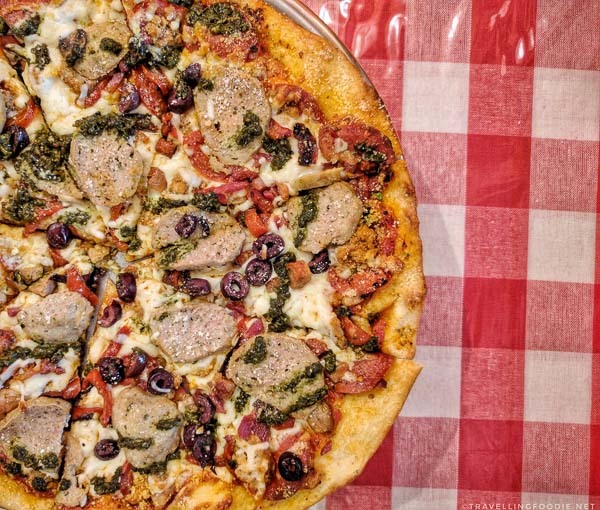 I got their special that day, Hogwild Pizza ($12). It was thin crust with decent amount of toppings. It was nice having it while walking around enjoying the views. One thing I love about Farmers’ Markets are the interesting things you’ll find. 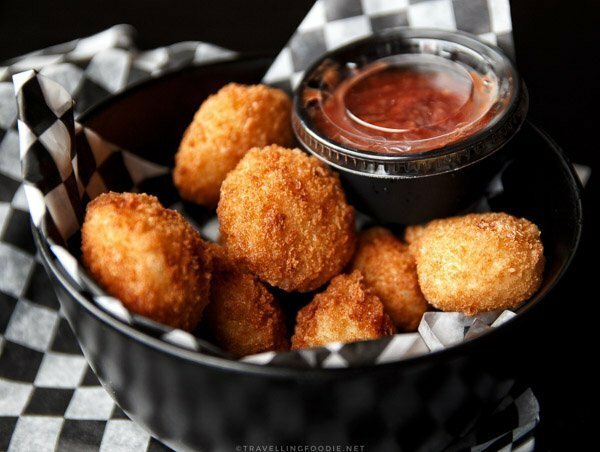 Edilicious makes fine cheese appetizers. These aren’t just your normal cheese spread, but gourmet ones. I sampled the sun dried tomato & basil with pecans & balsamic vinegar goat cheese and they were delicious. Alcoholic drinks are also available in the market. I enjoyed sampling Heritage Estate Winery and Cidery‘s Ciders and Cran-Apple Sangria. 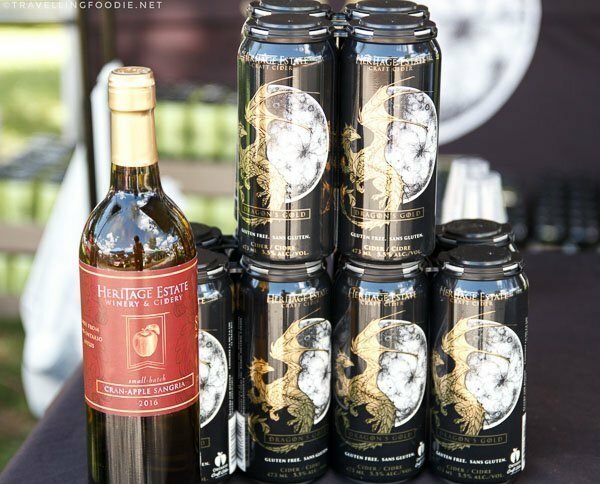 I liked the Dragon’s Gold Cider more than the Eden’s Apple because it was sweeter and less dry. They recently introduced a unique Cran-Apple Sangria – so think wine but using cider. It was great! 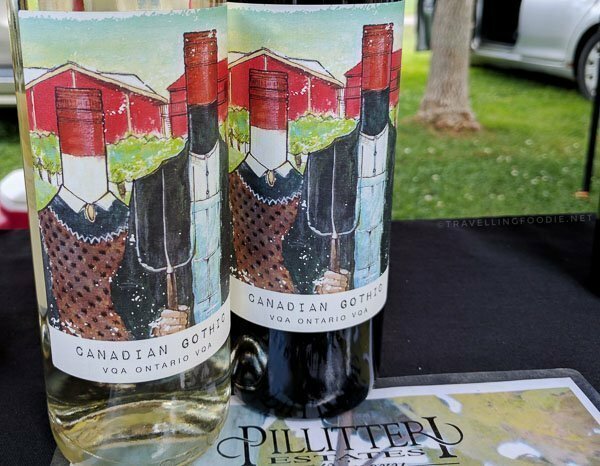 And if I thought there was no more room for surprises, I found out that Pilletteri Estates Winery has wines that are only sold in Farmers’ Markets, the Canadian Gothic Red and White. I sampled them both and they were really good that I bought one to take home. There were about 38 vendors that day, so it was a great afternoon checking out what the vendors have to offer. 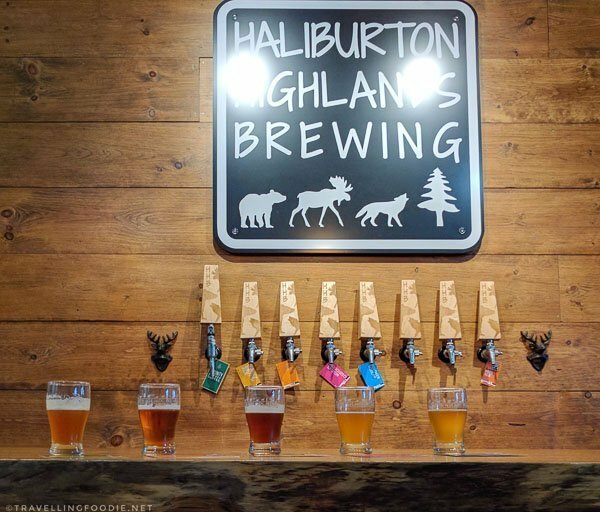 One of the local breweries in Haliburton Highlands is Haliburton Highlands Brewing, an award winning micro-brewery incorporating local ingredients in their handcrafted ales. Did you know? Husband and wife, Michael and Jewelle Schiedel-Webb, were thinking of what they could do so they can live and work in the cottage country, and Jewelle suggested a craft brewery. They recently moved to this new site which is much bigger and better. It even has a nice patio outside where you can enjoy your beer. Inside, there’s a retail section selling some merchandise (clothing, glassware, and beer swags), bottles and growlers. 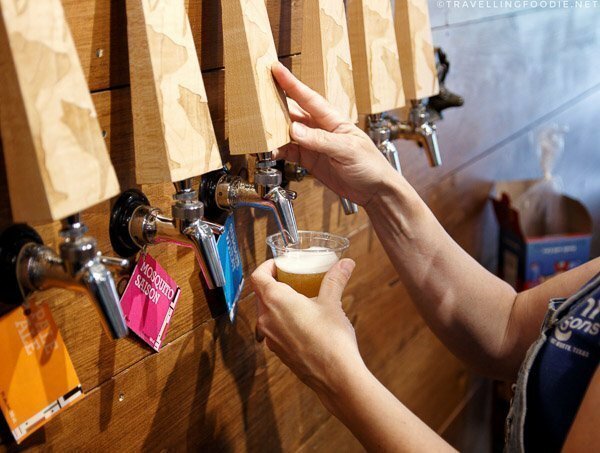 Beer tasting is also available straight from the tap! My favourite was the Mosquito Saison, a special spring seasonal using Ontario grown flaked rye. Be sure to do the brewery tour! It’s nice to see the equipment they have from the old production site versus the new ones. The heat exchanger was also interesting to learn as their process helps in their goal in being a sustainable brewery. 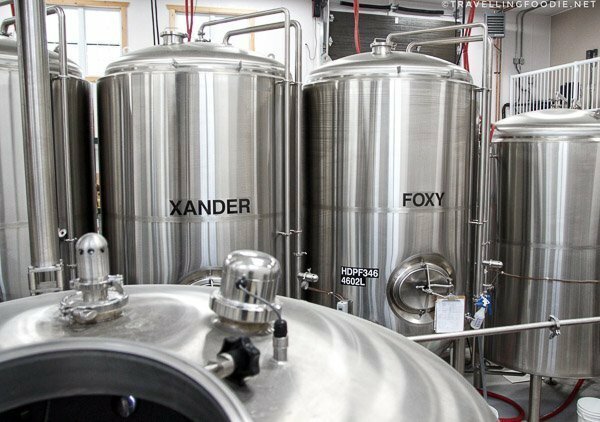 Travelling Foodie Tip: Be sure to ask about the names on the fermentation tanks! Quite a nice bit of trivia there which hopefully you know the references to. 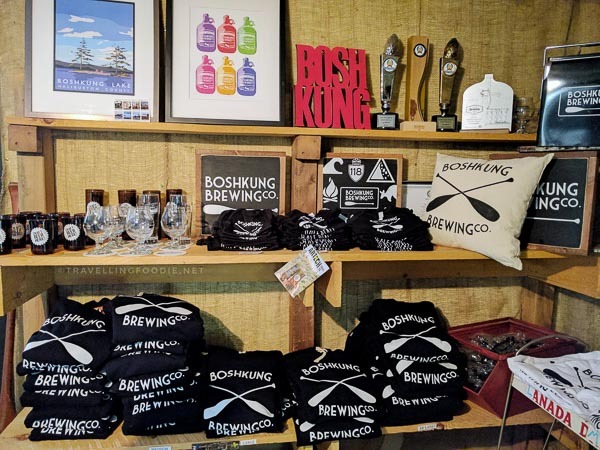 The other brewery is Boshkung Brewing Co. from the same owners as Rhubarb Restaurant. Isn’t that great? 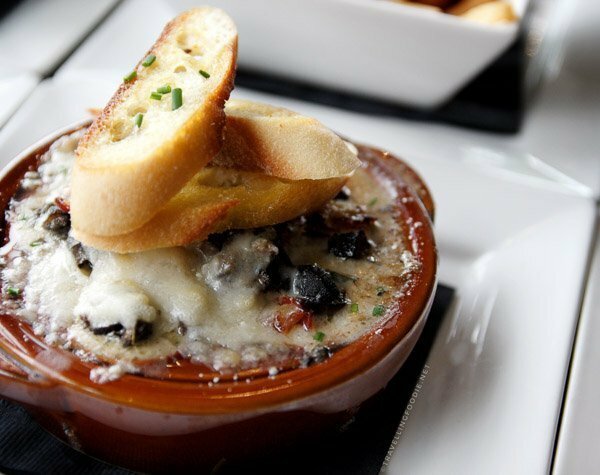 You get two birds in one stone with your food and drink experience at Haliburton Highlands. 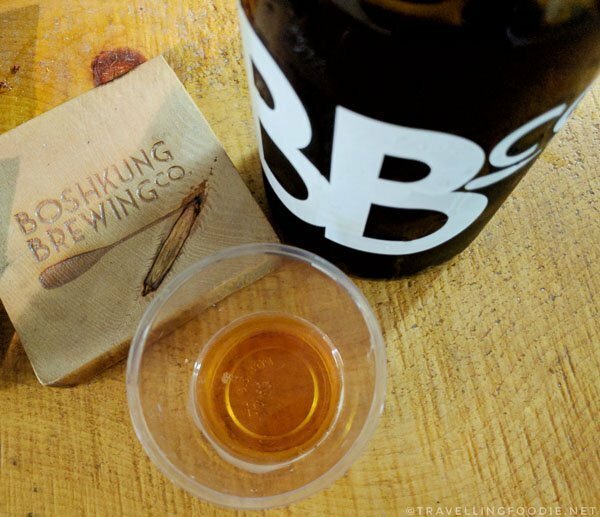 Boshkung Brewery is a small batch brewery, where most of the brewing processes are done manually. 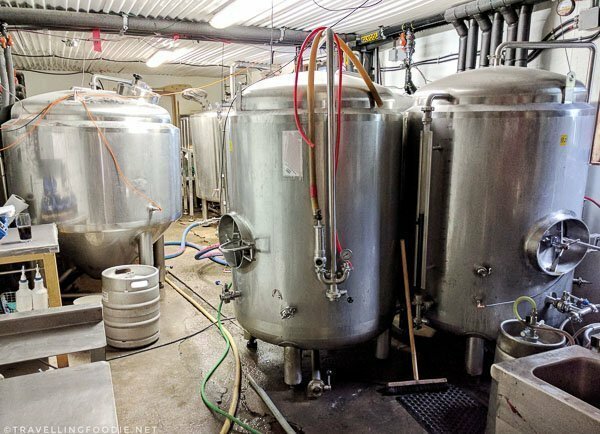 I recommend you do both tours (this and Haliburton Highlands Brewing) because some of their processes and equipment are different, which I found interesting to learn. 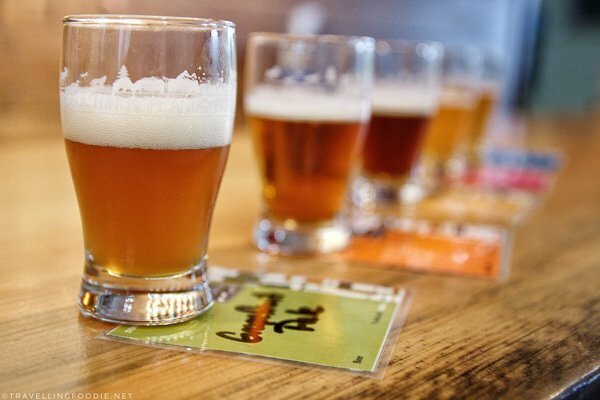 Tasting room is available to sample their beers. My favourite was the 35 & 118 Cream Ale since I favour less hoppy yet highly refreshing beers. They also have a retail store where you can buy clothing and merchandise, as well as growlers, mini growlers and cans of their beers. 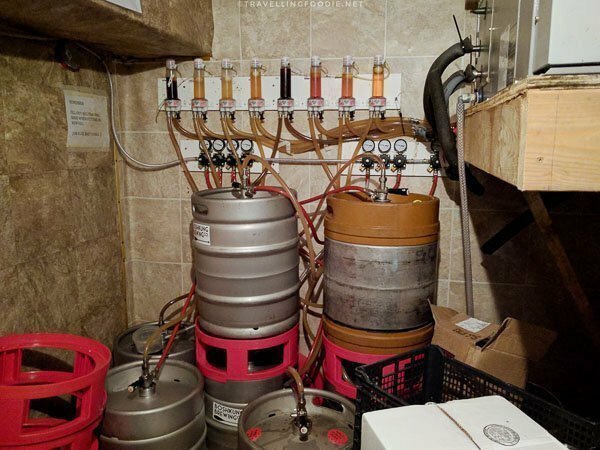 If you’re dining at Rhubarb Restaurant and want to have their beer, you’re guaranteed freshness as their kegs are connected to the taps at the restaurant! 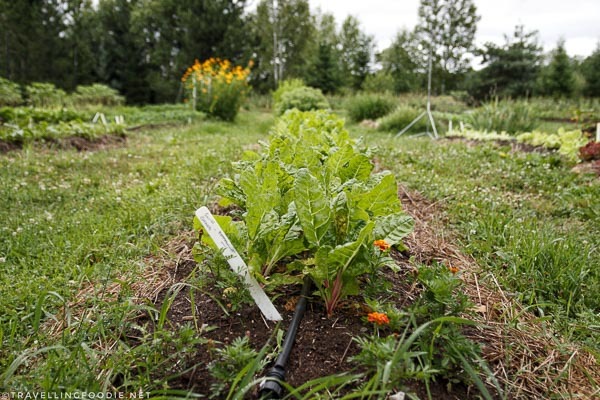 A not-for profit charity, Abbey Gardens vision is to transform a 300-acre gravel pit into a gardens that provides economic and recreational value in Haliburton Highlands. There are old farm trails across their 140-acre mature forest. A wide variety of local food and homemade products are available at the Food Hub. These products are sourced within 200-km. 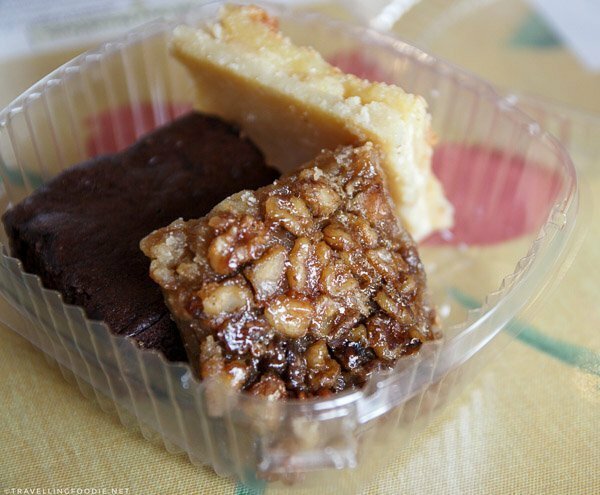 There are two local businesses on-site at the Food Hub: Into The Blue Bakery and County Coffee. 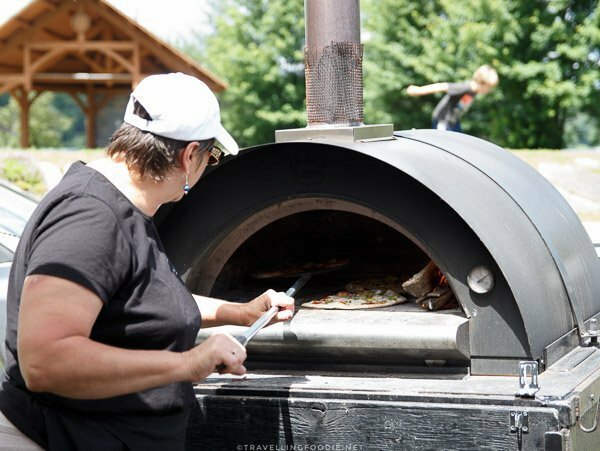 Into The Blue Bakery, which you can also find in the Haliburton County Farmers’ Market, makes their fresh wood-fired pizzas at the Food Hub as well. The County Coffee roasts their coffee beans fresh daily. 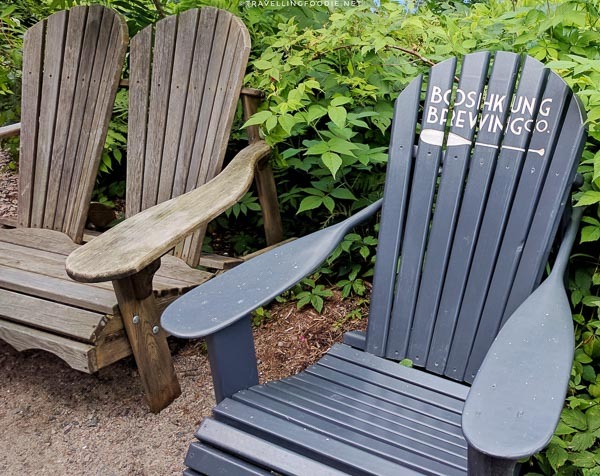 Haliburton Highlands Brewing is also at Abbey Gardens but outside the Food Hub, so you can enjoy some pizza while having your beer at the brewery’s patio. It’s amazing what they’ve done to this piece of land. About 2 acres have been converted to a vegetable garden patch already. The vegetables are sold in the Food Hub. 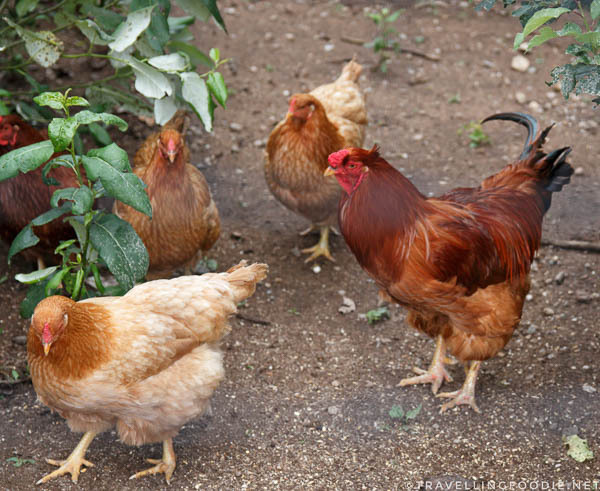 An interesting thing to learn is they grow heritage breeds of livestock here to preserve biodiversity in agriculture. 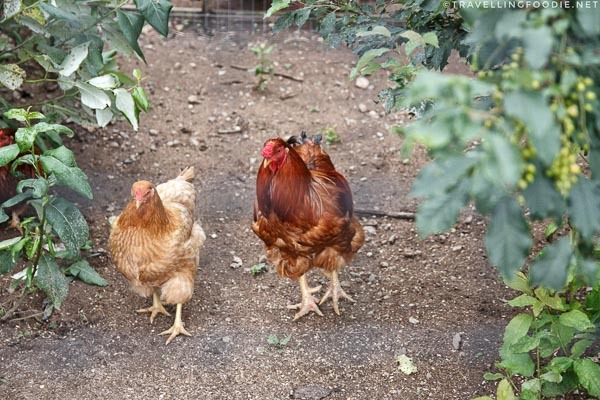 A breed originating in Quebec in early 20th century, the Chantecler Chicken is not your typical chicken as they are built to withstand immense cold and frost bite with their small cushion comb and wattles. 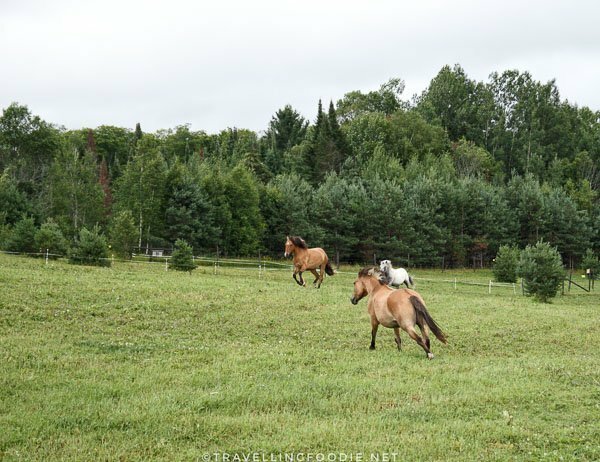 Further along from Haliburton Highlands Brewing’s site is a 1/2 acre pony paddock that has some Lac La Croix Indian Ponies. These Canadian breed ponies are virtually extinct with only about 200 ponies left on record. 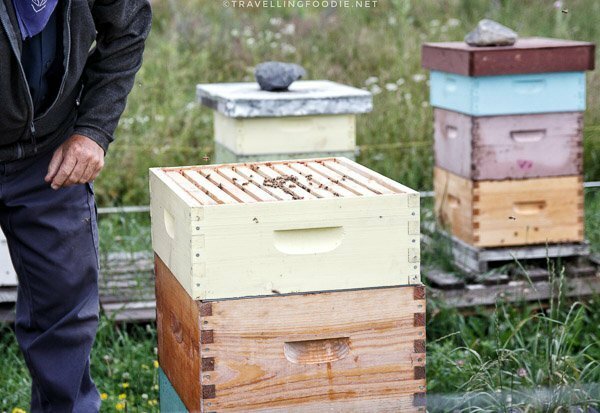 Abbey Gardens have now started hosting honeybee hives on site as well to help pollinate the gardens, and produce honey that gets quickly sold out at the Food Hub. Did you know? Bees must collect nectar from 2 million plants to create one pound of honey. 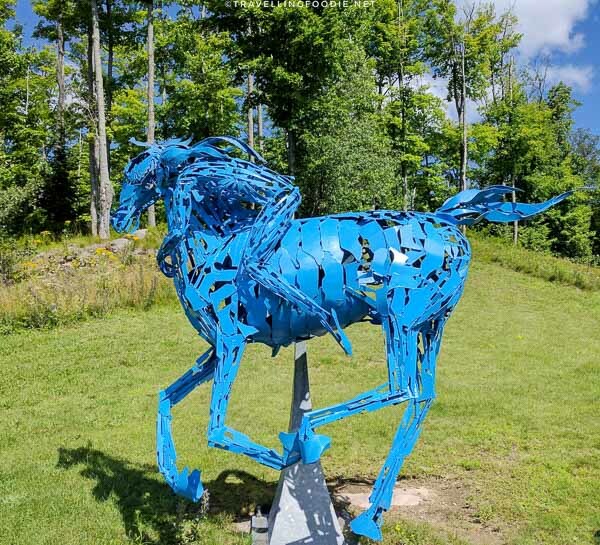 Opened in the fall of 2001, the Haliburton Sculpture Forest is a beautiful outdoor park with over 30 collections of sculpture created by local and international artists along nice nature trails. 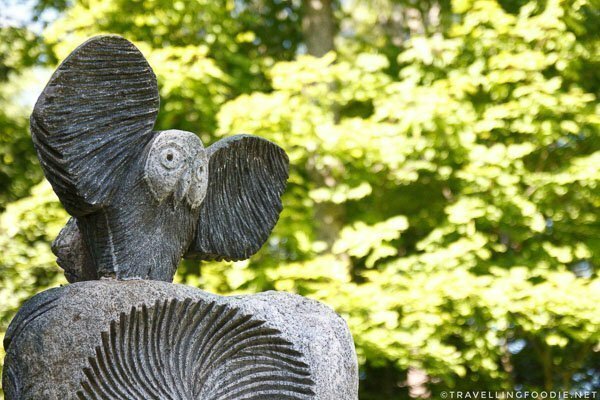 I’ve always loved sculpture parks, having visited quite a few in the USA. It is a great combination of art and nature! I didn’t know we had something like this in Ontario, let alone in a cottage country. It’s just amazing! You can do a self-guided tour, but I highly recommend doing their free tours. 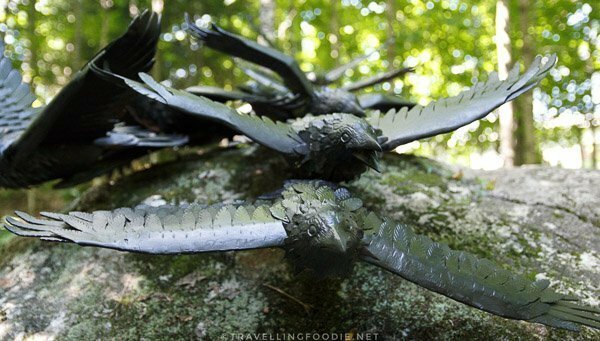 There are two kinds: On Tuesdays, there’s a walkthrough of the sculpture forest going over all sculptures in 1.5 hours. On Wednesdays, there’s the Curator’s Selection Tour that takes 40 minutes. 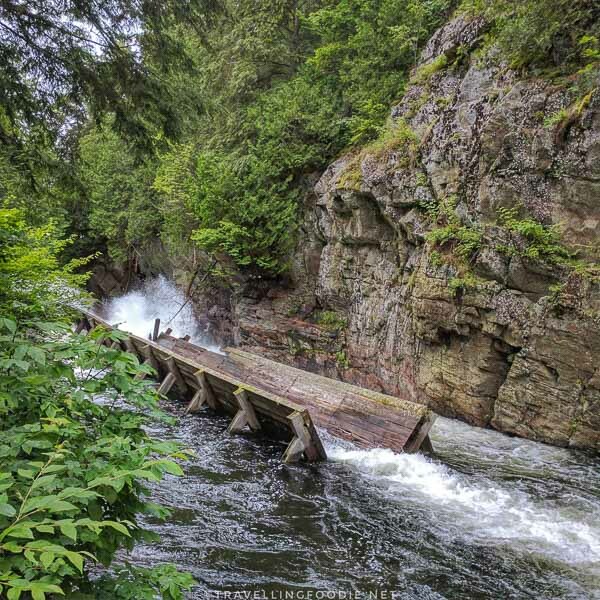 The Hawk Lake Log Chute is a historic site bringing us back in time when log chutes were being used to carry logs from rivers to the sawmill. 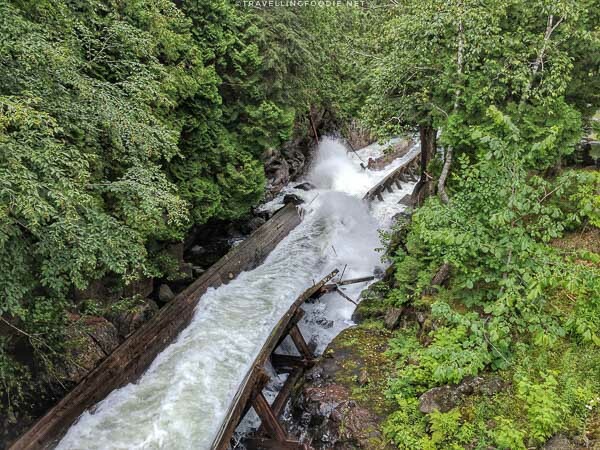 Unfortunately, thousands of the log chutes in the province from the late 1800s are all gone now. Luckily, there is still this log chute in Hawk Lake since 1861 for us to appreciate being the only one of its kind. 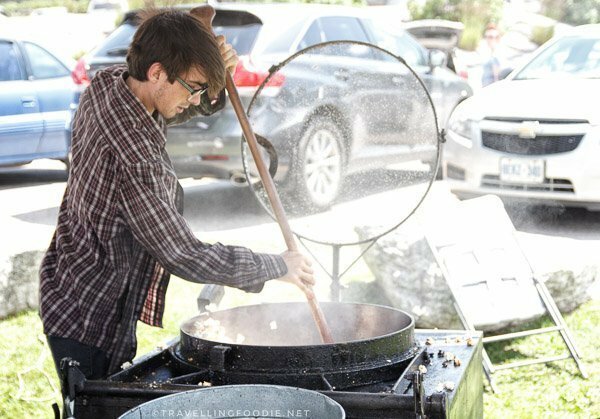 A few hours after the Haliburton County Farmers’ Market, the Music in the Park took place. I got lucky because I didn’t even know about this if not for locals I was talking to during the trip. 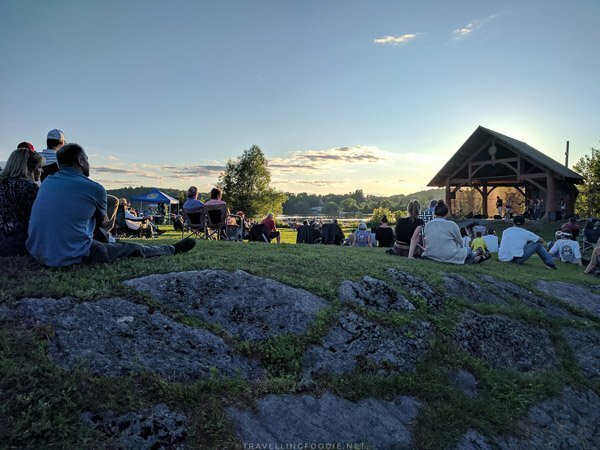 Presented by the Rotary Club of Haliburotn, The Music in the Park is a summer event that showcases local bands and singers every Tuesday. During my visit, I got to hear the talented Northbourne and Cassidy Glecoff. 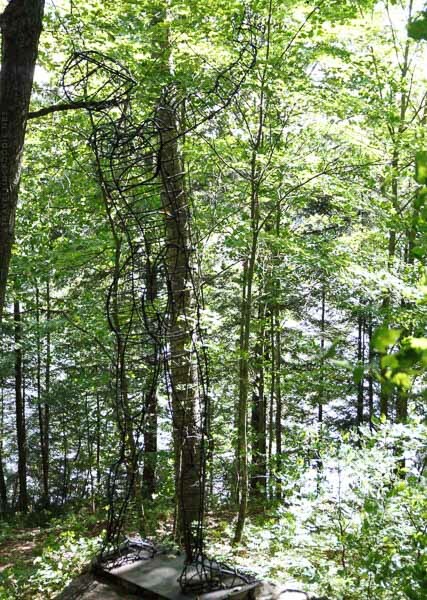 Haliburton Highlands has an abundance of nature with lakes, trails, rivers and more. 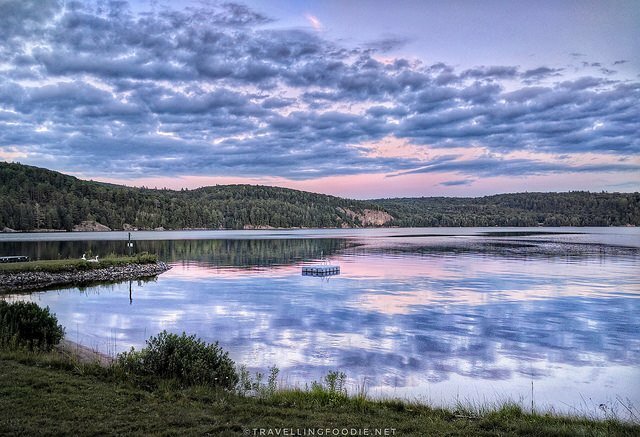 With 600 lakes, you will definitely not miss seeing one of them even when you drive by the roads. I stayed in a mini cottage at the Cabins at the Domain which is right by Drag Lake. The main lake in Haliburton is Head Lake. 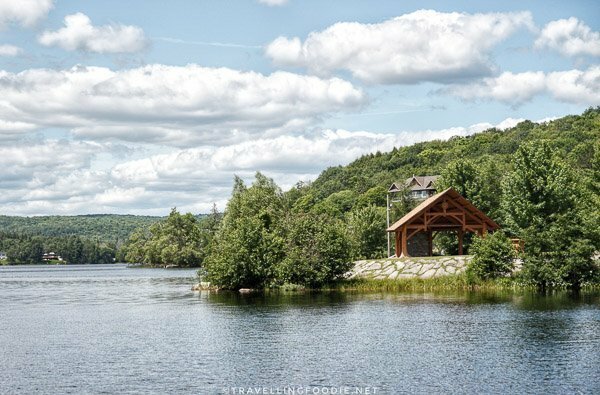 There are so many things around this lake including Haliburton School of Art + Design, Haliburton Highlands Museum, Haliburton County Farmers’ Market, Baked and Battered, and more. 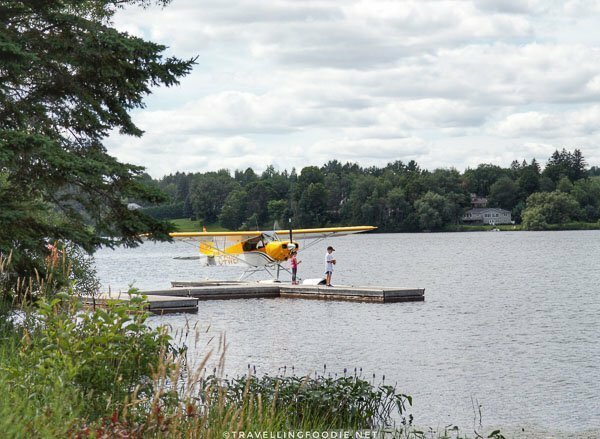 On the south west end of the lake, you’ll also find two iconic figures: Haliburton Rotary Locomotive and Royal Canadian Legion Avro CF-100 Jet Fighter Memorial. If you like to run, jog or simply walk around, this would be a great way as these two are located at a circular field with a running track where people jog and run. The Head Lake Park is also here where so many events take place because of the band shell. When you dine at Rhubarb Restaurant or The Mill Pond Restaurant, or visit Boshkung Brewing, you will definitely see the Mirror Lake. But also nearby is another major lake, Boshkung Lake, where Boshkung Brewing got its name. Adjacent to it on the north end is the Buttermilk Falls. A little north from Buttermilk Falls is Halls Lake. I like how the county has setup picnic sites on different lakes. 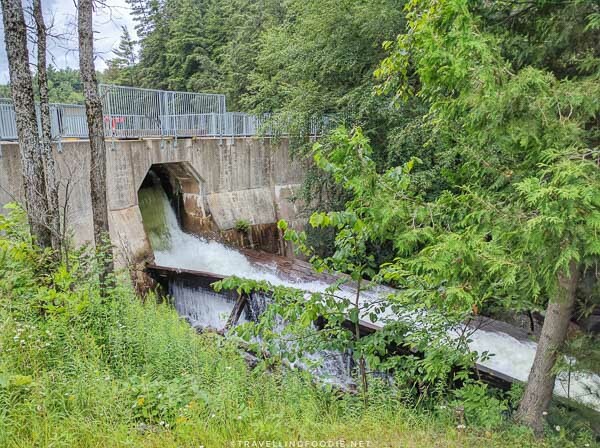 When you’re visiting the historic Hawk Lake Log Chute, you will get to see Hawk Lake as well. With Haliburton Highlands having about 600 lakes, I definitely wanted to stay somewhere lakeside. 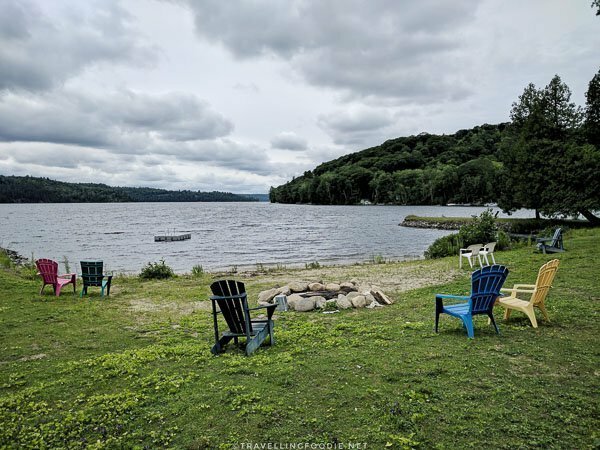 Cabins at the Domains was the perfect spot for what I was looking for as it is right on Drag Lake, and part of the Thurston Wildlife and Forest Reserve covering 5000 acres of wild forests and lakes. 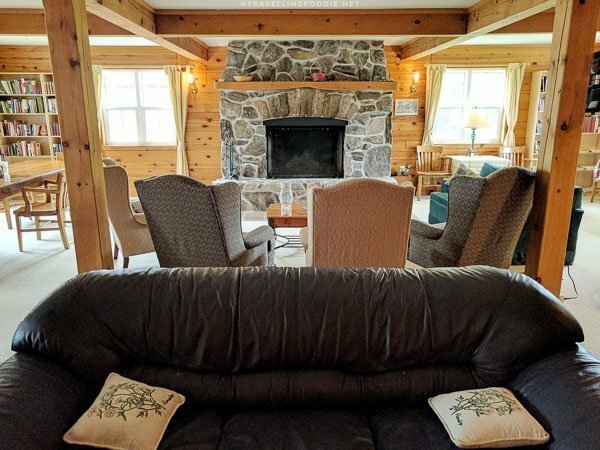 The Cabins is conveniently located for accessibility: 15 minutes to Haliburton, 20 minutes to the Haliburton Forest and Wolf Centre, and about an hour to Algonquin Park. Present owner Lynn Feagan, on her 5th year of business in 2017, lives on-site and was very helpful and welcoming to me. I stayed at the Roseline cabin ($200/night), which is directly by the lake. 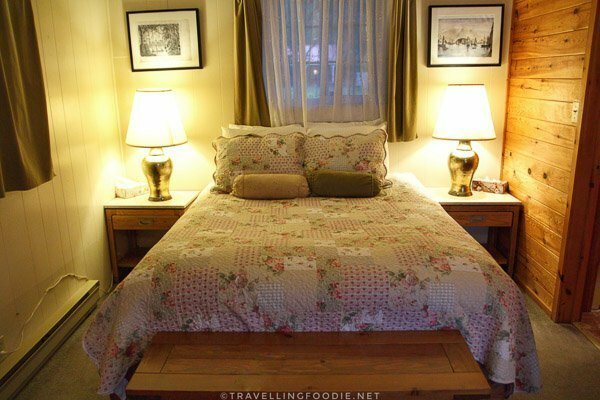 It’s good for a solo traveller or a couple with its queen sized bed, small bathroom and sitting area. Inside also has a wood burning fireplace, bar fridge, coffee maker, microwave and a kettle. It has a sliding door that opens to a sun porch which overlooks the lake. This was my view right from the cabin porch. Isn’t it amazing? Each cabin also has its own barbeque grill, which is perfect for summer BBQ. Interestingly enough, the tap water throughout the Cabins at the Domain is drinkable, a really great way to save your wallet and environment from bottled waters. I didn’t really get to take advantage of all this because it was quite cold in the morning, and I was out exploring throughout the day after. 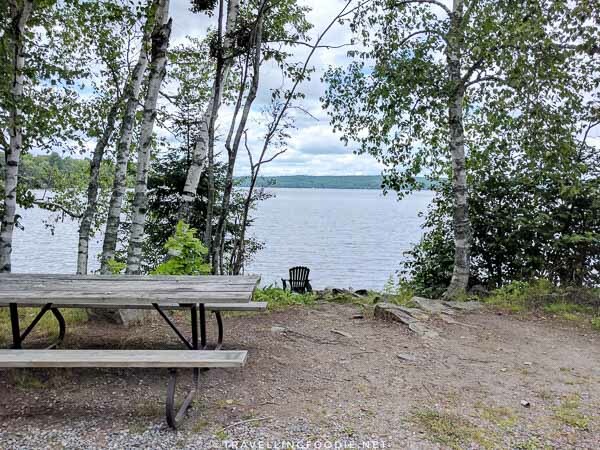 There are lawn chairs, picnic tables and a fire pit if you want to enjoy just being outside and the lake. I really wish I had time to just spend the day here as they also had kayaks and canoes available to use for free on the lake. That would’ve been so much fun! Maison Cozette is the reception / common house for guests to enjoy. This is where I had my Molly’s Bistro Bakery baked goods for breakfast everyday. Self serve breakfast for two people is provided including bagels, eggs, milk, toast, coffee, and more. You can also cook because the kitchen is fully equipped with all dishes, cutlery, pots, pans, a regular size fridge, a dishwasher and sinks. The Main Lodge is for groups, weddings or family reunions. It has five bedrooms and a lounge with fireplace. 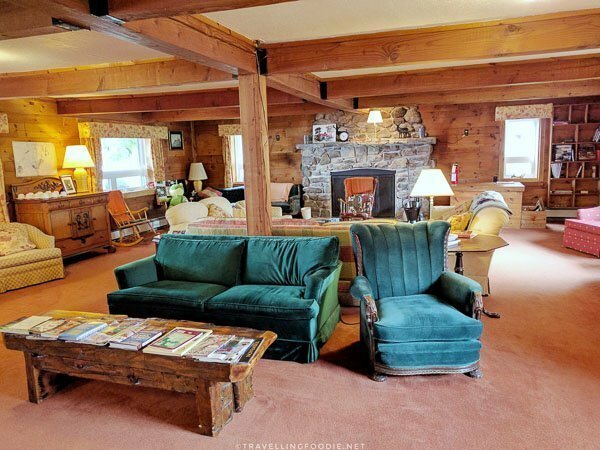 Conference Room has lots of light and sitting areas, equipped with a harvest table, stone fireplace, easels, overhead projector, large screen TV and dvd/cd player. It also has a kitchen. 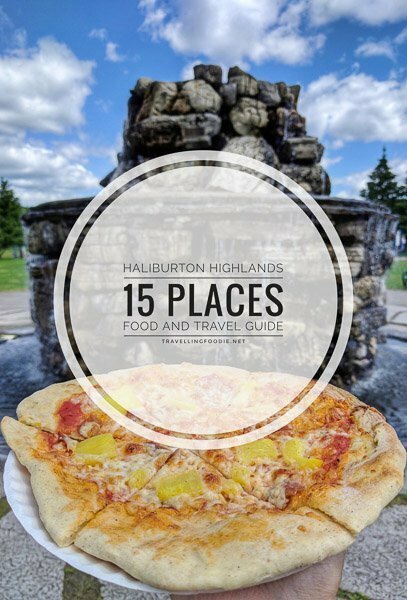 There are so much more to see in Haliburton Highlands, and I know I didn’t get to cover them all! What are some of your favourites that I covered, or missed? Let me know! 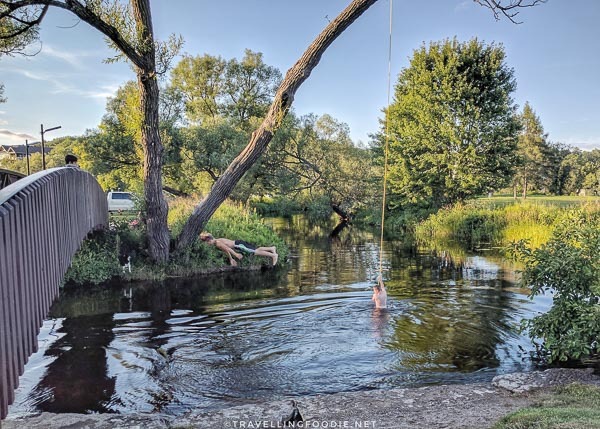 Posted on August 8, 2017 January 5, 2019 by Travelling FoodiePosted in Algonquin Highlands, Canada, Food, Haliburton, Haliburton Highlands, Minden Hills, Ontario, TravelTagged accommodations, entertainment, events, guides, nature, products, restaurants, sights and landmarks, tours, transportation. Some other notables! There is an amazing Thai Restaurant in Minden, Wild Orchid. There are a few waterfalls. 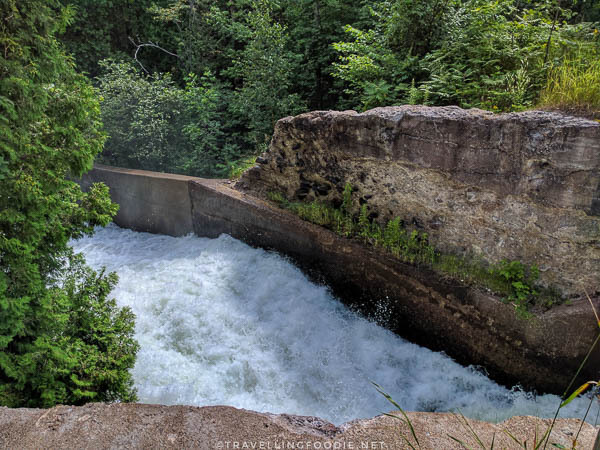 I am lucky to own property along the beautiful gem, Ritchie Falls in Lochlin. 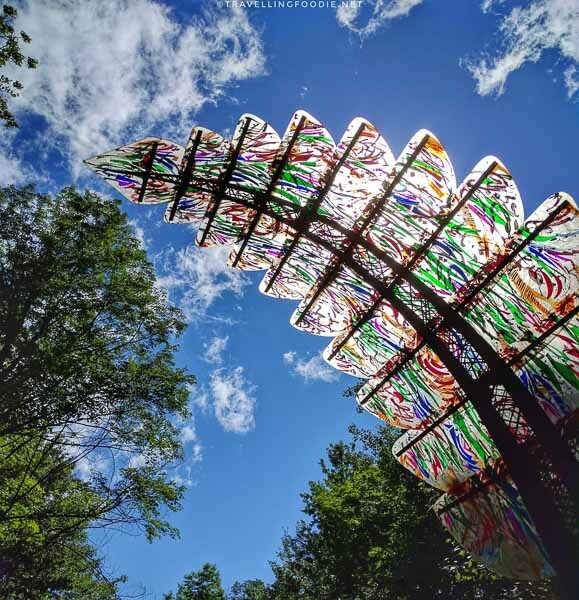 We have an incredible music venue, The Forest Festival mid August. It is held at Bone Lake and the Logging Museum. Great musicians like Buffy St. Marie and Jim Cuddy. The Forest and Wildlife Reserve is 60 acres and has Walk in the Clouds and a Wolf Centre. We have an incredible summer Opera event and year round plays. We have Those Other Movies monthly and The HIF, Haliburton Film Festival. 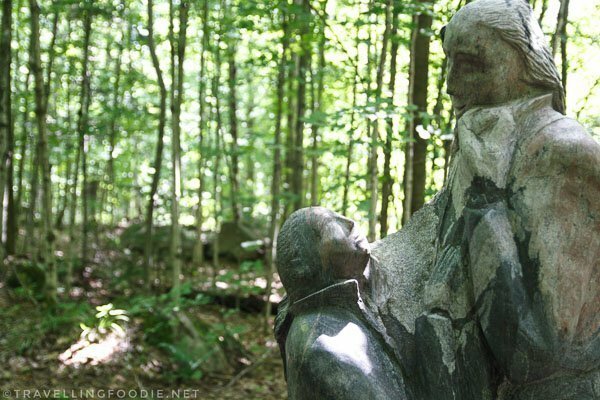 So much to see and do in Haliburton Country. We also have many not for profits providing essential service to those in need such as Heat Bank, 4 Food Banks, HERS( YWCA womenâ€™s shelter), Places for People,(affordable housing), SIRCH. We have Canoe FM our volunteer community radio station! We have a huge volunteer base that without many of us, events would never take place. So blessed to live here.